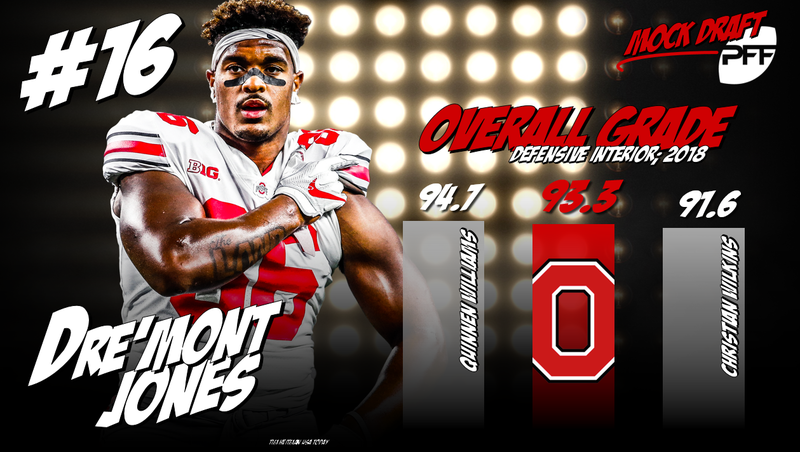 The first PFF 2019 NFL Mock Draft is upon us, as we’ve decided to unveil our first 32-name scramble earlier than ever. It’s important to remember that it’s still extremely early in the draft process, but like most mocks, it’s also a good exercise to get a feel for which names and team fits are standing out at this point. Given that we are only three weeks into the NFL season, the draft order is irrelevant and simply an estimate based on PFF’s very early win projections for 2018. After taking Saquon Barkley instead of a quarterback a year ago, the Giants get a chance for redemption by taking Herbert. 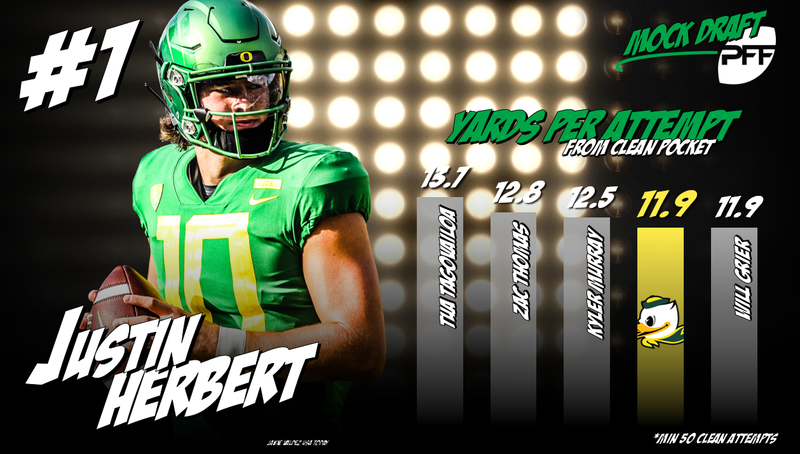 There’s still room to grow in Herbert’s development, but he has the accuracy, velocity and athleticism to carry his strong college production to the NFL. The best defensive player in the draft, Bosa has two-plus years of excellent production under his belt and he brings the Bills a much-needed pass-rusher as he’s won 30.4 percent of his rushes this season (best in the nation) and Buffalo’s scheme is predicated on creating pressure from the front four. The Browns add another piece to their evolving defense, this time on the interior of the defensive line. Simmons can rush the passer and stop the run, all leading to a 90.0 overall grade that ranks sixth among interior defensive linemen this season. Capable of playing in any scheme, Baker is particularly a good fit for Arizona’s zone-heavy system. He moves well and he’s a playmaker, allowing a passer rating of only 32.6 into his coverage this season. Williams excels in press man coverage due to his combination of size and speed. He adds a key piece to a Detroit secondary that wants to play more man coverage under new head coach Matt Patricia. It’s all about surrounding QB Deshaun Watson with playmakers, and Brown has the size and speed to create mismatches all over the field. He’s been particularly productive in the slot at Ole Miss, where he led the nation with 1,251 yards a year ago. One of the breakout stars early in 2018, Thompson has shown that he can be a do-it-all safety, from playing deep zones to covering the slot to playing in the box. His 93.3 overall grade leads all safeties through four weeks. While Oliver has two-plus outstanding years of production under his belt, he’s been far better as a run defender than he has been rushing the passer. This season, he’s improved his pass-rushing grade at 82.8 and he becomes a key part of Seattle’s rebuilding effort along the defensive line. New quarterback Sam Darnold needs help on the outside and Brown brings one of the best deep threats in the draft. He ranks seventh in the nation with 195 yards on deep passes this season. At 340 pounds, Lawrence can blow up run plays, but he’s also adept at rushing the passer, making him a valuable all-around interior defensive lineman. He has 11 pressures on just 44 rushes this season. Washington adds a weapon on the outside for QB Alex Smith as Arcega-Whiteside is one of the best in the nation as creating plays down the field due to his body control and physicality. His 89.7 overall grade ranks third among receivers this season. The Colts continue to rebuild their offensive line with one of the nation’s most productive offensive tackles. Risner has only allowed one pressure on 128 attempts this season. Harry is yet another big-bodied receiver in this draft and he adds a fine complement to the current receiving corps in San Francisco. He can make contested catches or create after the catch as he’s forced nine missed tackles on his 26 receptions this season. 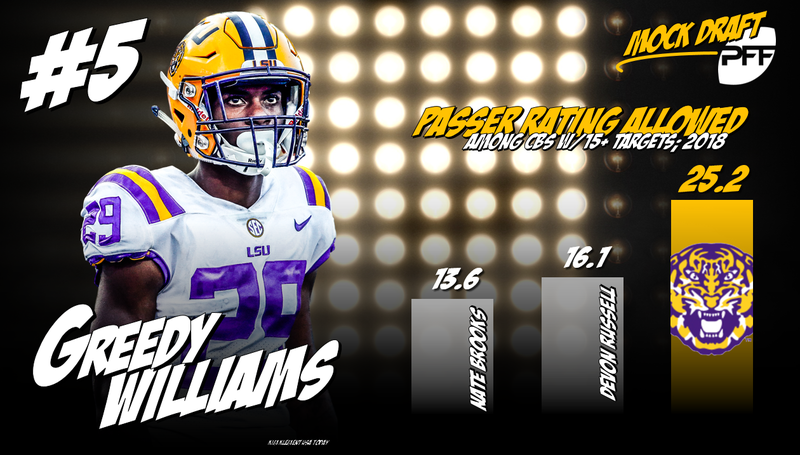 Williams continues to improve and he’s been nearly flawless in pass protection this season, allowing only two pressures on 132 attempts through four weeks. He can step in at right tackle for the Ravens. Another breakout star for the Crimson Tide, Williams is currently the highest-graded interior defensive linemen, has been dominant against the run and he’s gotten after the quarterback with an 89.3 pass-rush grade that ranks sixth in the country. He adds a much-needed playmaker to the Oakland defensive line. The Cowboys have been looking for an interior pass-rusher for a few years and Jones fits the bill. He’s currently third with a 90.4 pass-rush grade as he’s notched four sacks, one QB hit and three hurries on 94 rushes this season. The annual exercise of mocking an athletic linebacker to the Packers continues. This time, Bush adds sideline-to-sideline speed and the ability to get after the quarterback as a blitzer, both good attributes for Mike Pettine’s defense. Bush has 33 pressures on 122 rushes over the last two years. Youth is needed up front for Carolina and Jelks is one of the best edge rushers in the draft. He has the No. 7 grade among edge defenders at 86.6 overall to go with 16 pressures on 95 rushes. The search continues for consistent cornerback play in Pittsburgh and Oruwariye adds a playmaker with excellent size. He has two interceptions and four pass breakups on 27 targets this season. Little still has room to grow, but he’s continued to progress since being a five-star recruit. This season, he’s allowed only two pressures on 130 attempts, and he can start right away in Los Angeles on the right side. 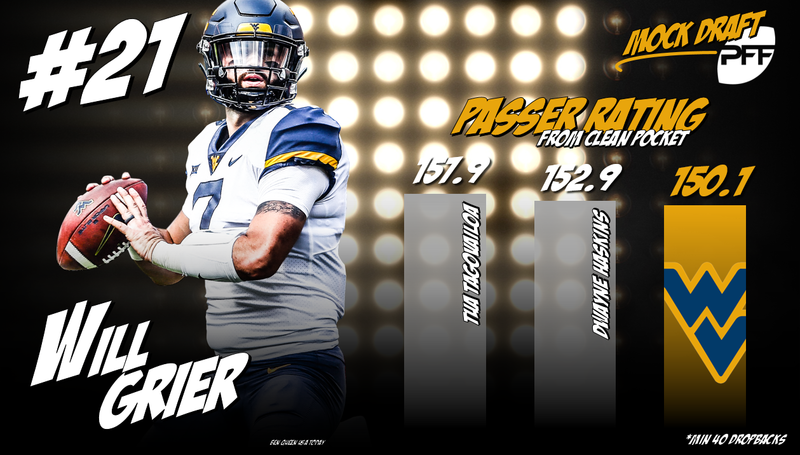 The second quarterback off the board, Grier is one of the best downfield throwers in the country and he’s the highest-graded quarterback in the nation at 94.1 overall. With one more year of Case Keenum under contract, the Broncos are one of few teams around the league that is still in the market for their future signal-caller. There’s some rebuilding to do along the defensive front in Miami and Gary has all of the tools to develop into an excellent pass-rusher. Currently, he’s been strong against the run and he’s notched 15 pressures on 90 rushes this season. Green Bay adds even more speed to the roster, this time on the other side of the ball. Fant is an explosive tight end who can stretch the seam, but he must cut down on his nine drops on 51 catchable passes over the last two seasons. Despite the strong additions up front to the defensive line last offseason, you can never have too many pass-rushers off the edge and Burns’ continued growth makes him an intriguing option. He’s an athletic rusher who has broken out this year to grade at 77.0 as a pass-rusher. The Bengals have made strides defensively, but linebacker has still been an issue in recent years. Allen brings three-down ability as he graded at 90.0 overall last season and he’s grading among the nation’s best this year at 79.9. His continued growth in coverage bodes well for his NFL future. There aren’t many holes on the defending Super Bowl champs, but adding another outside weapon makes this offense even more dangerous. Johnson has excellent ball skills and he’s a good route runner for his size, all leading to an 86.1 receiving grade that ranks seventh in the nation this season. Biadasz is a perfect fit for the Falcons’ zone-running scheme at center, and even with starting center Alex Mack locked up through 2020, Biadasz can improve Atlanta’s guard situation. He’s currently the highest-graded center in the nation at 86.4 overall. If there’s a question mark on the Rams’ loaded defense it’s at edge defender where Sweat looks like a prototype at 6-foot-6, 245 pounds. He’s off to a strong start this season with four sacks, five QB hits and seven hurries on his 72 rushes. Samuel is off to a slow start this season, but at his best, he’s a nifty route runner with after-the-catch ability. His last healthy season was 2016 when he averaged 7.5 yards after the catch per reception and forced 12 missed tackles on only 45 catches. 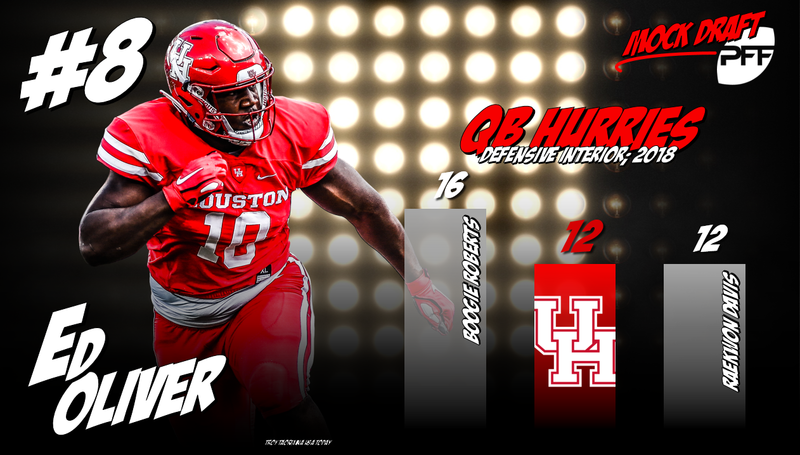 Kansas City must start rebuilding their defense and Tillery adds a big body up front that is capable of getting after the quarterback. He’s currently second among interior defensive linemen with a 90.7 pass-rush grade. The Vikings are strong up front, but youth is needed on the interior defensive line. Enter Wilkins who is excellent against the run and off to a strong start as a pass-rusher this season, grading at 90.0 with seven pressures on only 56 rushes. 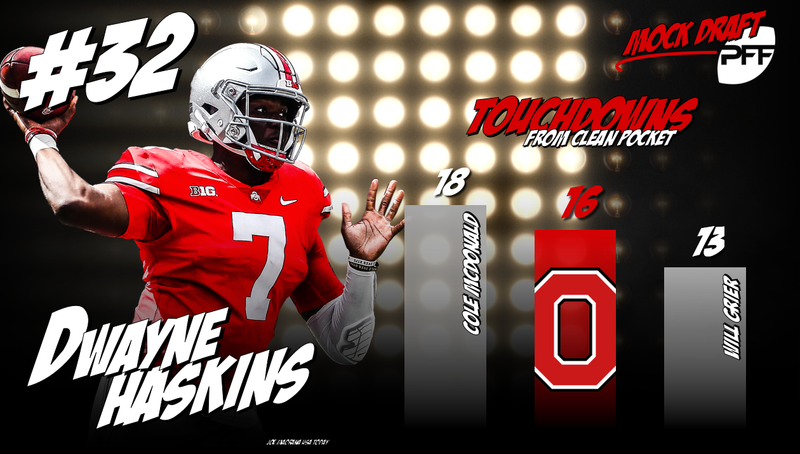 After missing out on a quarterback last year, the Patriots look to the future with Haskins who has shown the ability to throw with zip, touch and accuracy in the early going here in 2018. His 91.0 overall grade is currently ranked sixth in the nation among quarterbacks.